Driven From Their Homes, Driven to Succeed. When they left their home outside Damascus, Bashar and his wife Thanieh and their children thought they would return home shortly, after things had settled down. They never imagined the violent conflict would last as long as it has. For two years, the family moved from place to place in neighboring countries, watching the Syrian conflict deteriorate further. They realized that they couldn’t go back home. Everything they knew there was gone. 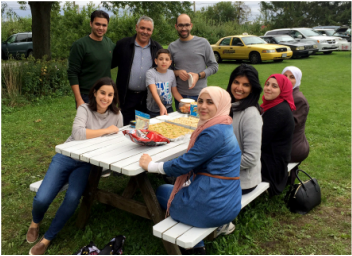 Bashar and Thanieh thought constantly about their three young adult children and two younger ones. They worried about their educational opportunities and the stress they were experiencing. While the family was preparing for their journey to the U.S., Annie McCarthy and Annie Snider were in Chicago looking for a way their workplace could make a difference. “We were both upset by much of the media and rhetoric surrounding Syrian refugees. I figured we could at least make sure that one family received a really warm welcome to the States,” says McCarthy. She pitched the idea of co-sponsoring a family with RefugeeOne to her colleagues at Boston Consulting Group’s Chicago office. Their response was overwhelmingly enthusiastic. Co-sponsorship was the perfect opportunity. Co-sponsors form a team to walk alongside a newly arriving refugee family in a variety of ways: furnishing an apartment that RefugeeOne provides, joining staff to welcome the family at the airport, fundraising to help with their initial expenses, and committing to mentor them weekly as they adjust to life in the United States. McCarthy says the positive feelings are mutual. “We talk about how we welcomed the family, but really they were the ones who welcomed us into their lives and their home.” Snider notes being encouraged by the family’s progress towards self-reliance as they’ve learned English and started new jobs. “One of the most gratifying things is to see them exploring on their own,” she says. ​Now that they are safely in the U.S., he hopes his children can move past the difficulties of the last few years and focus on pursuing their dreams. They’re already well on their way. 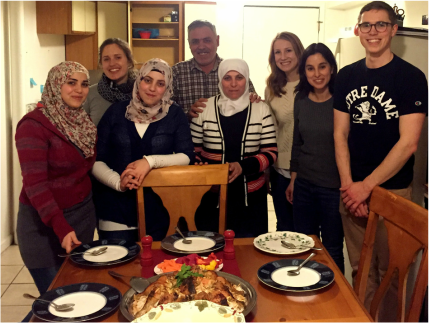 In the first few weeks of the family’s arrival, RefugeeOne enrolled the parents and young adults in English classes and assisted in their search for employment. Jamal (26) had a background in dentistry and found full-time work as a dental assistant. Asmaa (23) is looking to pursue an associate’s degree at Truman College to build on her previous education in IT. Abdullatif (21) had begun studying as an electrician before coming to Chicago, so he’s happy to have found work as an HVAC assistant. RefugeeOne also enrolled the two youngest family members in school. Esraa (17) is enjoying 10th grade and is making many friends as her English is quickly progressing. Mohamad Nour (10) has made friends at the RefugeeOne after-school program and attended his first Chicago Fire soccer game this summer.